At Gold Mountain Trading, we take great pride in the history that is such a big part of our Western merchandise. Generations of our family have contributed to improving the service and quality of our products. That’s why we’re proud to have long ago partnered with Minnetonka Moccasins to bring you footwear that is as rich in history and tradition as our custom belt buckles and our Western jewelry. The Minnetonka Moccasin style has stood the test of time since its inception in 1946. The classic design and comfort of Minnetonka boots make them the perfect footwear for any occasion. 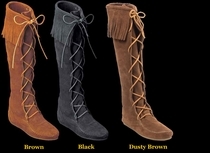 The soft and natural material allows the boots to mold and flex with your feet, while its unique stitching and stylish fringe will readily complement any outfit. These versatile boots can take you anywhere from the Colorado mountains to Times Square. We always provide free express shipping for orders over $50 in the continental US! If you have any questions, feel free to contact us at (800) 474-9111 during our business hours 9 am – 5pm CST Monday-Friday, or use our quick and simple online contact form.